The uveal tract comprises the iris, ciliary body (CB) and choroid. While the iris forms the diaphragm which controls light entering the eye and the choroid forms the vascular coat of the eyeball, the CB controls accommodation, produces aqueous humor and secretes glycosaminoglycans into the vitreous. The CB is a complete ring running on the inside of the sclera anteriorly. On an average it is 6mm wide (6.5mm temporally and 5.5mm nasally). Anteriorly, it is bound by the scleral spur and posteriorly by the ora serrata. On cross-section, the CB appears as a right-angled triangle. The apex is contiguous posteriorly with the choroid, while the base faces anteriorly towards the anterior chamber. The outer angle anteriorly faces the scleral spur. 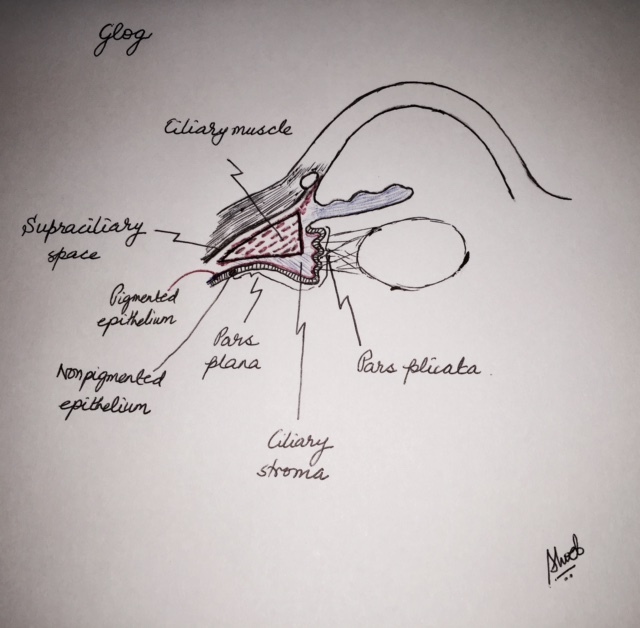 There is a potential space between the CB and the sclera known as the “supraciliary space”. The outer surface of the CB forms the base of the angle. It has an anterior ridged or plicated part called the pars plicata, and a smooth and flat posterior part known as pars plana. The posterior margin of pars plana has a scalloped edge which interdigitates into the corresponding tooth-like edge of the ora serrata. The pars plicata or corona ciliaris surrounds the periphery of the iris. It is conspicuous by the presence of ciliary processes, which are characterized by approximately 70 radial ridges (major ciliary processes) and an equal number of smaller ridges (minor or intermediate ciliary processes) present between them. The pars plicata measures approximately 2mm in length, 0.5mm in width and 0.8-1mm in height. In the spaces between the ciliary processes are present the zonules, which suspend the lens from the pars plicata. (i) Ciliary epithelium: The ciliary epithelium consists of 2 layers of cubical cells covering the inner surface of the ciliary processes and pars plana. These layers are embryologically derived from the 2 layers of the optic cup. The outer pigmented layer is continous with the retinal pigmentary epithelium and is composed of low cuboidal cells. The inner non-pigmented layer is continous with the neuro-sensory retina and is formed of columnar epithelium. The bases of the outer layer face outwards (towards the sclera), while the bases of the inner layer cells face inwards (towards the aqueous). Therefore, the apices of the cells in the 2 layers face each other. At places they are separated by small spaces known as ciliary channels. In the non-pigmented cells the basal and lateral plasma membranes have extensive foldings which interdigitate with neighboring cells forming tight junctions (zonular occludentes). This forms the blood-aqueous barrier. The cytoplasm of these cells has a well developed Golgi apparatus, extensive granular and agranular endoplasmic reticulum and many mitochondria. The anterior portion of the non-pigmented ciliary epithelium has abundant sodium-potassium-adenosine-triphosphatase (Na+-K+-ATPase), active glycolytic enzymes and experimental evidence of aqueous production. The pigmented layer cuboidal cells are packed with numerous melanin granules. The cytoplasm is scant with a small Golgi apparatus and numerous mitochondria. This layer is separated from the stroma by an atypical basement membrane, a continuation of Bruch’s membrane, containing collagen and elastic fibers. The basal plasma membrane has marked infoldings suggestive of active ion transport. There is a possibility that both the pigmented and non-pigmented layers are involved in aqueous production. The numerous cell attachments also point to the possibility that the activities of the 2 cell layers are coordinated. (ii) Ciliary stroma: Each ciliary process consists of a central stroma and capillaries, covered by a double layer of epithelium. The capillaries occupy the centre of each process. The endothelium of the capillaries is thin and fenestrated, representing areas with fused plasma membranes and no cytoplasm which might be helpful in increased permeability. The basement membrane surrounding the endothelium is found to have mural cells or pericytes. The stroma contains a ground substance (mucopolysaccharides, proteins and plasma of low molecular size), collagen connective tissue (especially collagen type III), melanocytes and the embedded ciliary muscle. (iii) Ciliary muscle: The bulk of the substance of the CB consists of smooth muscle fibers of the ciliary muscle. The CM consists of 3 separate muscle fibers: Longitudnal, oblique and circular. The longitudinal or meridonial fibers are the outermost (closest to the sclera). These attach the CB anteriorly to the scleral spur and trabecular meshwork at the limbus, while posteriorly to the suprachoroidal lamina (fibers connecting the choroid and sclera) at the level of the equator of the eye. Contraction of the longitudinal muscle opens the trabecular meshwork and Schlemm’s canal. The oblique fibers (radial or intermediate) connect the longitudinal and circular fibers. They run from the first layer to the third layer and radiate out from the scleral spur. The contraction of the fibers widens the uveal trabecular spaces. The circular (sphincteric) fibers are the innermost and run around the eyeball like a sphincter. The contraction of the longitudinal and circular fibers pulls the CB forwards during accommodation. This forward movement relieves the tension in the suspensory ligaments, making the lens more convex increasing the refractive power of the lens to aid in near vision. The CM is innervated by the post-ganglionic parasympathetic fibers derived from the oculomotor nerve. These fibers reach the muscle through the short ciliary nerves.